Home > Blogs > Stellar Rain: Devon Lane's Heir Apparent? On June 30, 1996, Devon Lane made his racing debut against two other Thoroughbreds and six Quarter Horses. He finished third in the 870-yard "around the hook" event at New Mexico's Ruidoso Downs. A Quarter Horse won the race. The runner-up, a Thoroughbred, was by a stallion with an advertised stud fee of $500. 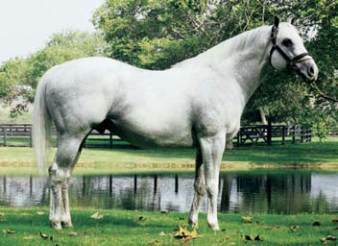 Devon Lane's sire, Storm Cat, had stood the 1996 season for $125,000. This scene is true to the rough-and-tumble Southwest racing circuit, where it's all about speed and not about frills. Or maybe Devon Lane's connections knew they had a fast horse and that's right where he belonged. Against his own breed, Devon Lane won three races—all sprints at Ruidoso—before retiring to stud in New Mexico. He became a successful dual-purpose regional sire, covering both Thoroughbred and Quarter Horse mares. His Thoroughbreds include 19 stakes winners, most notably Princess Rooney Handicap (gr. I) winner River's Prayer. Devon Lane earned a following in the Southwest, but his multiple grade I-winning half sisters Starrer (by Dynaformer) and Stellar Jayne (by Wild Rush) are better known to the industry at large. Darley bought Stellar Jayne for $3.6 million in 2004 and, after racing her another season and winning another grade I, bred her to Storm Cat. 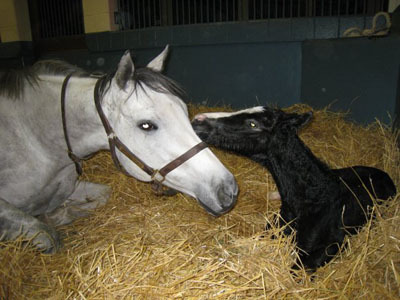 The foal was Stellar Rain (who, coincidentally, I helped foal while a member of the Darley Flying Start program). Stellar Rain never raced, not against Thoroughbreds or any breed. He injured a suspensory in the paddock as a yearling which delayed his training and ultimately kept him from ever making it to the races. Darley's rehoming program, which finds suitable homes for Darley ex-racehorses, set out to find a buyer for the young stallion prospect. Enter Wendy Davis, the associate coordinator of the Race Track Industry Program (RTIP) at the University of Arizona. Wendy also breeds horses on a small scale in New Mexico and was quite familiar with Devon Lane. "The first thing that jumped out at me was that he was very closely related to Devon Lane," Wendy said. "The second was that he had the look that horsemen in the Southwest generally preferred: well-muscled and not too tall." Wendy suspected Stellar Rain could be the right kind of horse for a very sprint-oriented regional market. "This horse did not have the look of the classic two-turn horse, and for probably the first time in his life, that became an attribute." 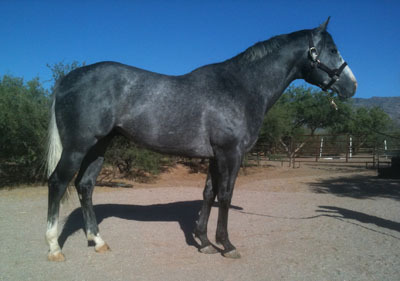 Wendy also knew that in New Mexico, such a stallion had twice the appeal. "Devon Lane was not only popular with the Thoroughbred breeders, but he also had some excellent Quarter Horse runners," Wendy said. "Having two potential markets made sense, so I jumped into stallion ownership knowing full well the very long odds of making a stallion." As it would play out, Stellar Rain was in the right place at the right time. When 19-year-old Devon Lane died of heart failure last year, Stellar Rain was ready to fill the vacancy. Wendy read the press release about Devon Lane's passing and immediately called Terry Lane of TNL Farm, where Devon Lane had stood. "I'm sure I caught Terry quite off guard as all I said was that I had a stallion related to Devon Lane, and would he be interested in talking about standing him," Wendy said of the initial phone conversation. "Terry researched who the horse was and called me back pretty quickly saying, 'Do you know what you have?!' "
Earlier this year, Stellar Rain stood his first season at TNL for a modest $1,000 fee. He covered about 30 mares—split evenly between Thoroughbred and Quarter Horse—including a few stakes and stakes-producing mares. Thirty mares is a pretty good number considering the increasingly strong credentials to be found among the New Mexico stallion colony. The odds are likely still long for Stellar Rain to reach the heights of his predecessor, but as Devon Lane reminded us, sometimes sires emerge from the most unexpected beginnings.